Top 7 Disney World Souvenir Recommendations + Where to Find Freebies! One of the most anticipated parts of a Disney World vacation is planning your souvenir budget! While it can be easy to get caught up in the many, many stores you will find at Disney World- there are some souvenirs that stand the test of time. Here are our top seven recommendations for souvenirs that last. Disney pins are small metal images with a pin back depicting characters or Disney attractions from the parks typically displayed on a lanyard worn around your neck. Disney pin trading is a program where guests interact with cast members and other park guests. To participate, one must purchase an official Disney pin and then find a cast member with a set of Disney pins of their own. Approach the Disney cast member and request to trade pins. Indicate the pin that you would like to trade for and give them the one you would like in exchange. Cast Members honor all trading requests whereas other guests may only trade for a pin they want. To find out more about pin trading, be sure to check out the ultimate guide to Disney Pin Trading. Since the beginning of the Disney Parks, the classic Mickey Mouse ears have been a staple. Women have a plethora of Minnie ears to chose from as well. Minnie ears have become quite the trend to wear to the parks with ears matching each season of the year! After you have your ears, take plenty of pictures! Located in Disney Springs, visit the Silhouette Portraits Cart and get a hand-cut a silhouette of you or your child’s head. For $9.99 a person you get two identical copies of your silhouettes. The skill of the artisan Cast Members is absolutely amazing. They can outline any head with a hat or without to create an inexpensive souvenir that you will want to to keep forever. In the park you can find plenty of machines that will press pennies into designs representing Walt Disney World. Each machine in every land will have images that represent the rides such as the shop next to Pirates of the Caribbean a guest can get a penny stamped out to have the “Dead Men Tell No Tales” saying imprinted. The pressed pennies cost 51 cents per penny. One penny to press and two quarters to pay. Use shiny pennies so your image looks great! Disney also sells penny books to store your collection. If you visit Guest Relations at Walt Disney World, you can pickup a map of all of the different locations to get a pressed penny. In Walt Disney World’s Magic Kingdom in Liberty Square look for the Ye Olde Christmas Shop! Here you can choose from a variety of ornaments! This is a great park souvenir that will stand the test of time as you decorate for Christmas. Where to put the souvenirs once you have them…. Lockers are available at both parks for $10-$15 per day in all of the theme parks. You can also use Package Pickup if you spend more than two hours in the parks. Package Pickup is available in each Walt Disney World park. If you’re staying at a Walt Disney World hotel, your purchases can be sent back to your room free of charge! Each Disney Character will have a unique autograph central to their character! It’s a fun experience to run around the parks collecting autographs. 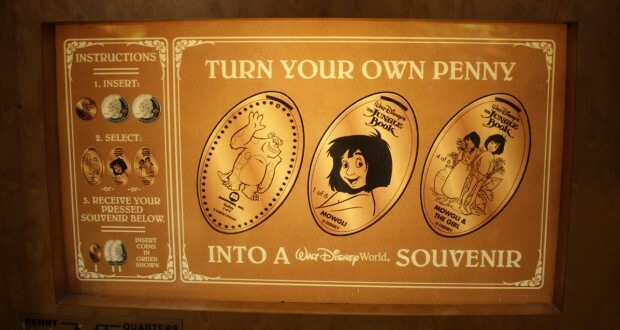 And it’s a great idea to have a Disney autograph book to keep them all in. You can find them on the Disney Store.com — you can purchase in advance to get the best one that works for you. You can also store photographs in the books too! 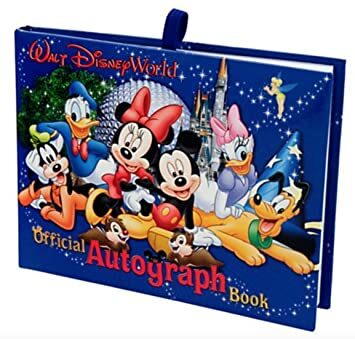 Disney sells ones that are a combo of pages for autographs and pictures. After you wait in line to meet the character, there might be a Disney PhotoPass photographer and the Disney Character handler at the front of the line. Ask them to take a picture with your phone, they will be happy to do so. Disney PhotoPass is a service where guests have their pictures taken by special Disney Cast Members throughout the park. The photos are then loaded onto a PhotoPass card and handed to you. They can also add special effects, called Magic Shots, to your pictures as well! These are great souvenir that you will treasure forever! For pricing and package information on PhotoPass check out Disney’s website. You can also find plenty of freebies around Walt Disney World! Here are some of our favorite freebies you can find around the Walt Disney World resort! 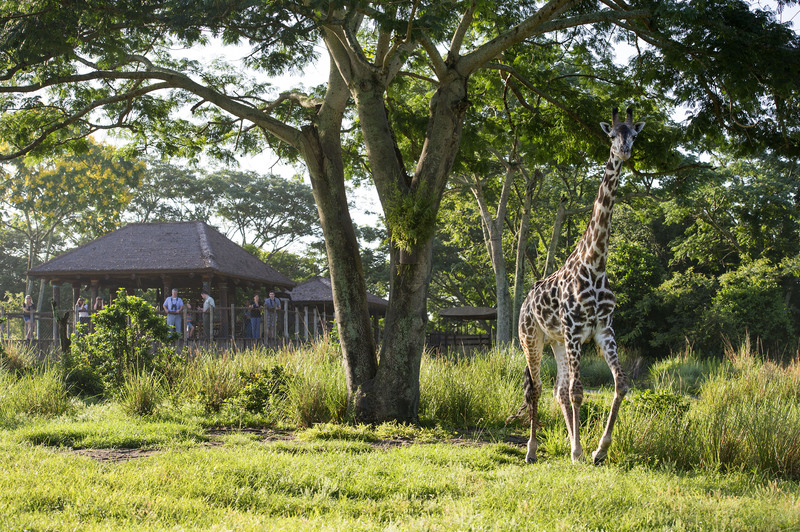 Go to the Animal Kingdom Lodge and ask for an “Animal Viewing Guide” free of charge. The booklet tells you about all the animals and makes a great keepsake. Go to the Wilderness Lodge and ask for a free “Hidden Mickey Hunt” guide at the front desk. It has lots of great hints for finding Hidden Mickeys at the resort as you can check them off as you find them. Stop by the Ghirardelli shop for free chocolate samples in Disney Springs! 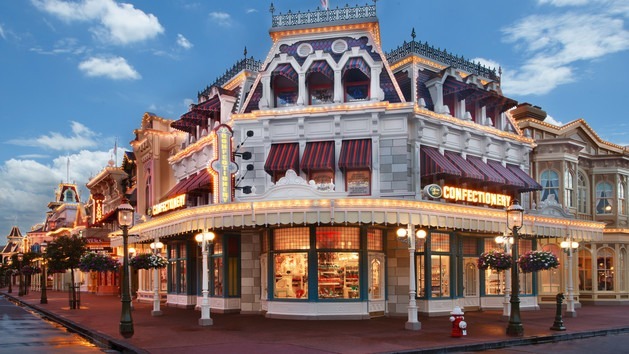 Along the Disney World Boardwalk you can find the Ample Hills Creamery and get a few free ice cream samples. 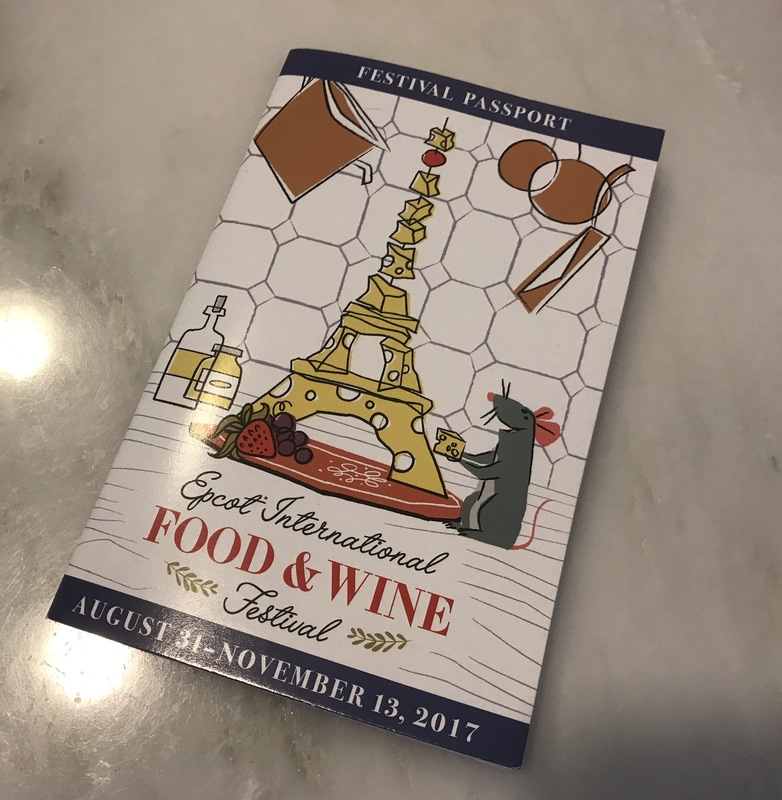 During the Epcot Food and Wine Festival, you can get free passports that each kiosk will stamp as you visit it. Club Cool in Epcot’s Future World offers free samples of soda sponsored by Coca-Cola. There are eight varieties from around the world to try. During non-busy times of the day there may be a Cast Member with samples of cookies, cotton candy, or other treats. 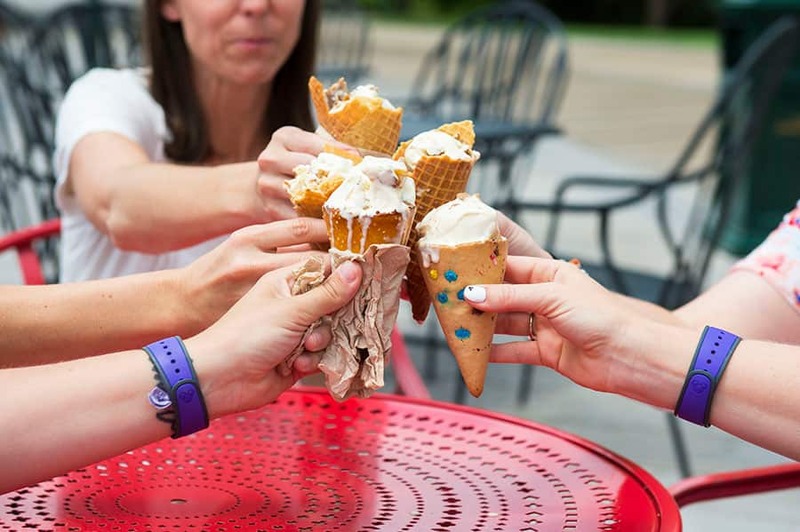 They also offer ice cream that you can sample before you order. Sunshine Seasons and Electric Umbrella at Epcot, Tortuga Tavern and Be Our Guest Restaurant in the Magic Kingdom, Backlot Express in Disney’s Hollywood Studios, and Restaurantosaurus & Satu’li Canteen in Disney’s Animal Kingdom are the only restaurants that have self-service drink refill stations. Disney’s Art of Animation Resort offers free drawing classes that are available to any Disney World resort hotel guests. The Animation Academy in Hollywood Studios also offers drawing classes which allow you to bring home your drawing as a keepsake. 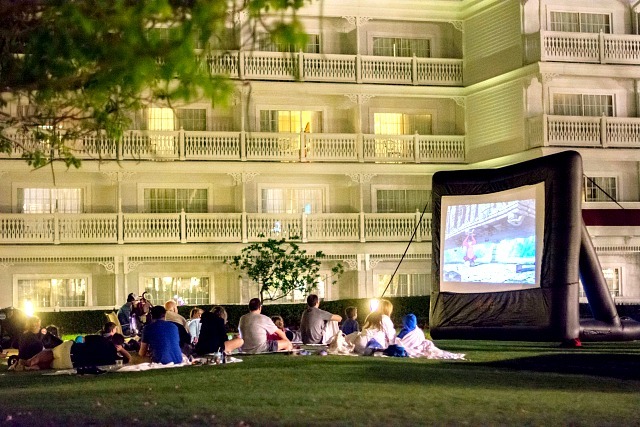 Many of the Walt Disney World hotels offer a Disney movie outside each night on outdoor movie screens that is free to hotel guests. If you are a Disney Chase Visa holder, debit or credit card, you can receive a free private meet and greet in Epcot which comes with a free printed PhotoPass photo. Outside of the Pirates of the Caribbean ride in Magic Kingdom there is an interactive treasure hunt with free maps that make great souvenirs. In Magic Kingdom your kids can join in on a free scavenger-style adventure themed from the movie UP! They can collect badges just like Russell and learn about all of the animals in the park and the booklet they get makes a great souvenir. The Polynesian Resort gives out leis not just to guests but anyone who visits the lobby. The leis make great freebies!